This is the first text to come along in many years that makes psychoanalytic personality theory and its implications for practice accessible to beginning practitioners. The last book of its kind, which was published more than 20 years ago, predated the development of such significant concepts as borderline syndromes, narcissistic pathology, dissociative disorders, and self-defeating personality. Contemporary students often react with bewilderment to the language of pioneering analysts like Reich and Fenichel and, since 1980, the various volumes of the Diagnostic and Statistical Manual of Mental Disorders (DSM) have reflected an empirical descriptive orientation that deliberately eschews psychodynamic assumptions. Consequently, today’s therapist in training may have little exposure to the rich clinical and theoretical history behind each disorder mentioned in DSM; to psychoanalytic expertise with widely recognized character patterns not mentioned in DSM, such as depressive and hypomanic psychologies, high-functioning schizoid personalities, and hysterical personalities; or to a comprehensive, theoretically sophisticated rationale that links assessment to treatment. Filling the need for a text that clearly lays out the conceptual heritage that psychoanalytic practitioners take for granted, this important new volume explicates the major clinically important character types and suggests how an appreciation of the patient’s individual personality structure should influence the therapist’s focus and style of intervention. Dispensing with the dense jargon that often discourages people from learning, Nancy McWilliams writes in a lucid, personal manner that demystifies psychodynamic theory and practice. Numerous clinical vignettes are presented with humor, candor, and compassion, bringing abstract concepts to life. Comprehensive in scope, this book will be valued by professionals and students alike. Psychodynamically oriented readers will find it an excellent introduction. What kinds of questions do experienced clinicians ask themselves when meeting a new client for the first time? What are the main issues that must be explored to gain a basic grasp of each individual’s unique psychology? How can clinical expertise be taught? From the author of Psychoanalytic Diagnosis, the volume takes clinicians step-by-step through developing a dynamic case formulation and using this information to guide and inform treatment decisions. Synthesizing extensive clinical literature, diverse psychoanalytic viewpoints, and empirical research in psychology and psychiatry, Nancy McWilliams does more than simply bring assessment to life – she illuminates the entire psychotherapeutic process. This manual is based on current neuroscience and treatment outcome studies that demonstrate the importance of focusing on the full range and depth of emotional and social functioning. Beginning with a classification of the spectrum of personality patterns and disorders found in individuals and then describing a profile of mental functioning that permits a clinician to look in detail at each of the patient’s capacities, the entries include a description of the patient’s symptoms with a focus on the patient’s internal experiences as well as surface behaviors. 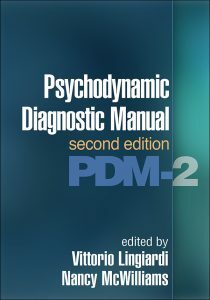 Intended to expand on the DSM (Diagnostic and Statistical Manual of Mental Disorders) and ICD (International Statistical Classification of Diseases and Related Health Problems) efforts in cataloging the symptoms and behaviors of mental health patients, this manual opens the door to a fuller understanding of the functioning of the mind, brain, and their development. The Alliance of Psychodynamic Organizations is a collaboration of the major psychoanalytic organizations including the American Psychoanalytic Association, International Psychoanalytical Association, the Division of Psychoanalysis of the American Psychological Association, American Academy of Psychoanalysis, and National Membership Committee on Psychoanalysis in Clinical Social Work.